Current ambitious reforms in India mean that public health professionals (PHPs) will become an increasingly vital component of the health workforce. Despite a rapid growth in schools of public health in India, uptake of places by students without a medical background is low. This paper reports the results of an exercise to estimate the baseline supply of, and need for, PHPs in India in 2017 and to forecast possible supply–need scenarios up to 2026. Supply was estimated using the stock and flow approach and the service–target approach was used to estimate need. The additional need resulting from development of a new public health cadre, as stated in the National Health Policy 2017, was also included. Supply–need gaps were forecast according to three scenarios, which varied according to the future intensity of policy intervention to increase occupancy of training places for PHPs from a non-medical background: “best guess” (no intervention), “optimistic” (feasible intervention), and “aspirational” (significant intervention) scenarios. In the best guess scenario in 2017, i.e. with a low non-medical place occupancy of 60%, there is a supply–need gap of around 28 000 PHPs. In the absence of any intervention to increase place occupancy, this shortfall is forecast to increase to 45 000 PHPs by the year 2026. By contrast, in the aspirational scenario, i.e. with a high place occupancy of 75% for non-medical places, the baseline gap for 2017 of almost 26 000 PHPs reduces by 2026 to around 21 000 PHPs. By 2026, most new PHPs will be produced by public health training programmes offered by institutions other than medical colleges. Without significant interventions, India is likely to have a significant shortfall in PHPs in 2026. Policy-makers will have to carefully examine issues surrounding the current low uptake of non-medical public health seats and review the current framework regulating training of PHPs, in order to respond adequately to future requirements. A strong health system is essential for achieving the Sustainable Development Goals (SDGs). Designing, implementing and monitoring health programmes is also central for delivering quality health services and ensuring universal health coverage. Health systems across the globe are dependent on the health workforce in improving health outcomes, and public health professionals (PHPs) form a key part of this workforce. A report from the Institute of Medicine notes that PHPs play a pivotal role in the creation and maintenance of a healthy community, defining a PHP as “a person educated in public health or a related discipline who is employed to improve health through a population focus”. Thus, public health is a combination of many cross-cutting disciplines, including but not limited to: medicine, behavioural and social sciences, statistics, management, communication, environment, nutrition, law and public policy. As estimated in a recent study, by the year 2030, global demand for health workers may rise to 80 million, which would require a doubling of the estimated stock of health workers in 2013. The supply of health workers is expected to reach only 65 million over the same period, leaving an estimated worldwide net shortage of 15 million health workers. Efforts to scale up health services to achieve universal health coverage and the other health aspects of the SDGs are confronted by acute shortages and inequitable distributions of skilled health workers in many low- and middle-income countries; in turn, this constrains efforts to deliver essential health services. The health workforce in India comprises broadly eight categories, namely: doctors (allopathic, alternative medicine); nursing and midwifery professionals; PHPs (medical, non-medical); pharmacists; dentists; paramedical workers (allied health professionals); grass-root workers (front-line workers); and support staff. This paper focuses on one of these categories, namely PHPs from both medical and non-medical backgrounds. PHPs include professionals from several disciplines and diverse fields, encompassing behavioural sciences/health promotion and communication; biostatistics; medical /health sciences; environmental health; epidemiology; health services administration/management; international/global health; maternal and child health; nutrition; public health laboratory practice; public health policy; and public health practice. Public health researchers, practitioners and educators work with communities and populations and contribute towards prevention of health problems, by implementing health programmes, developing policies, administering services, regulating health systems and conducting research. PHPs are thus a component of the overall health workforce and play a vital role in the creation and maintenance of a healthy community. Keeping communities healthy through the prevention of disease and promotion of health and wellness has historically been a low priority in India. However, priorities are changing and the need to shift focus to health promotion has been recognized at the highest levels, in initiatives such as Ayushman Bharat, with a roll-out of 150 000 health and wellness centres. India’s National Health Policy 2017 notes that a prerequisite is an empowered public health cadre to address the social determinants of health. The policy also proposes the creation of a public health management cadre, with an appropriate career structure and recruitment policy to attract young and talented multidisciplinary professionals. This proposal is also underscored in the 2018 NITI Aayog report, Strategy for New India@75, which describes the development milestones to be achieved by 2022, the 75th anniversary of India’s independence. Noting that there is no single authority responsible for public health in India that is legally empowered to enforce compliance from other public authorities and citizens, the strategy recommends including the creation of national and state public health agencies. The strategy also underscores the need for a dedicated cadre for public health at the state, district and block levels. In addition, recommendations on training of the relevant workforce include the need for officials qualified in disciplines including epidemiology, biostatistics, demography and social and behavioural sciences, and a mandated master’s level qualification, in addition to specified training, for officials taking on leadership positions. To plan for the ambitious reforms in public health delivery in India, valid and reliable information on the supply, need and gaps in the number of qualified professionals is needed. However, limited information is available. This paper reports the results of an exercise to estimate the baseline supply of, and need for, PHPs in India in 2017 and forecasts possible supply–need scenarios up to 2026. Owing to the lack of baseline data, the aim was not to provide granular, detailed forecasts but rather to give an overarching view of possible directions of change, in order to inform policy-making. For the purposes of this research, “supply” refers to trained PHPs from Indian educational institutions; “need” is the normative need for PHPs; and a “public health professional” is a person educated in public health or a related discipline who is employed to improve health through a population focus. Measurement of the health workforce for the purposes of policy and planning is not an exact science. Several approaches exist. For example, a 2013 working paper reviewed the main characteristics and results from 26 health workforce projection models in 18 Organisation for Economic Co-operation and Development countries. However, these focused primarily on physician models and also some nurse models. An impediment to developing the methodology for this project was the absence of any formal body or council for regulating public health education in India, limiting the information available on worker stock numbers and their trends. This, combined with the broad range of qualification routes in the different, and sometimes overlapping, disciplines and fields makes capturing baseline data from which to extrapolate projections challenging. One particular feature in India is that programmes offering the Master of Public Health (MPH) qualification – a source that might reasonably be expected to provide a significant number of PHPs in India – are relatively new and increasing, but their attractiveness to students is debatable. Specifically, between 1997 and 2016–2017, the number of institutions offering MPH programmes increased from 2 to 44. However, in the 2016–2017 academic year, 1190 places were being offered on these MPH programmes but only 704 students were enrolled – that is, a place occupancy of 59%. For estimating the supply of PHPs, the traditional approach was used, which attempts mathematical simulation of workforce supply projections based on a stock and flow model, where people entering and exiting the workforce (flows) periodically adjust the initial number in the workforce (stock). For need estimates of PHPs, the service–target approach was used, looking at the need within a range of public health disciplines individually, to get a total 2017 baseline. Based on current data on vacancies in sanctioned posts, the proportion of this total need that was filled in 2017 was estimated, giving a benchmark value for the number of PHPs per 100 000 population. Since the National Health Policy 2017 explicitly proposes the creation of a public health cadre in all states, the researchers were obliged to add the estimated need for PHPs that this policy, if implemented, will incur. An implementation timeline of the cadre starting in 2020 was used, with roll-out until 2026; the estimated numbers needed for this cadre was derived from previous work done to estimate the number of posts required at the state, district and block levels. high place-occupancy rates of non-medical PHP courses – the “aspirational” scenario, which is unlikely to happen without significant advocacy and appropriate intervention. Owing to the lack of data and uncertainties outlined, this modelling necessitated a series of assumptions and estimates. To ensure that these are clear, the methods and results are presented separately for each of the supply, need and supply–need gap analyses. For the supply of both medical and non-medical PHPs, the baseline number of training places offered in 2017 was first estimated. The forecast supply up to 2026 was then calculated, based on assumptions on place numbers, place occupancy and attrition. The forecasts for medical and non-medical PHPs were done separately, owing to differences in the assumptions made. Worked estimates were done for the start point/baseline (2017), midpoint (2022) and endpoint (2026) for the forecasting period. For medical colleges, the supply was estimated from the data available on the website of the Medical Council of India (MCI). The 2017 supply for various Diplomate of National Board (DNB) programmes being offered by the National Board of Examinations (NBE) was obtained from the NBE website. DNB is the degree awarded by the NBE, an autonomous academic body under the Ministry of Health and Family Welfare, Government of India, to candidates who successfully complete their postgraduate or postdoctoral medical education under the NBE. Institutions other than medical colleges, including schools of public health offering public health programmes in 2017, were identified in the Google search engine, using keywords such as “public health programs”, “public health courses”, “public health”, “BPH”, “MPH” and “schools of public health”. The search was limited to programmes offered in India and to collaborations between Indian and foreign institutions, if any. Additionally, the websites of the All India Council of Technical Education, University Grants Commission, universities and institutions were also searched, as well as education supplements of leading newspapers and education-based websites, including shiksha.com, targetstudy.com, getmyuni.com, and webindia123.com. Experts in the field of public health education were also contacted and related literature was also identified through Google Scholar and PubMed. Faculty and staff of several institutes/universities across India offering public health programmes were also contacted. The number of places available was also estimated through various public health domains; information was collected through the internet and education-related websites. Details were also collected from websites, prospectus and admission notifications; finally, experts, faculty and staff of institutes/universities offering these programmes were also contacted. It was assumed that the number of public health places offered by medical colleges will double in the forecast period. MCI data show there were 28 349 Bachelor of Medicine Bachelor of Surgery (MBBS) places in 2005 and 57 138 MBBS places in 2015; it was assumed that this rate of expansion will continue because of the current “pull” factors in India resulting from the recent government health initiatives and policies regarding public health and the professional cadre described previously. 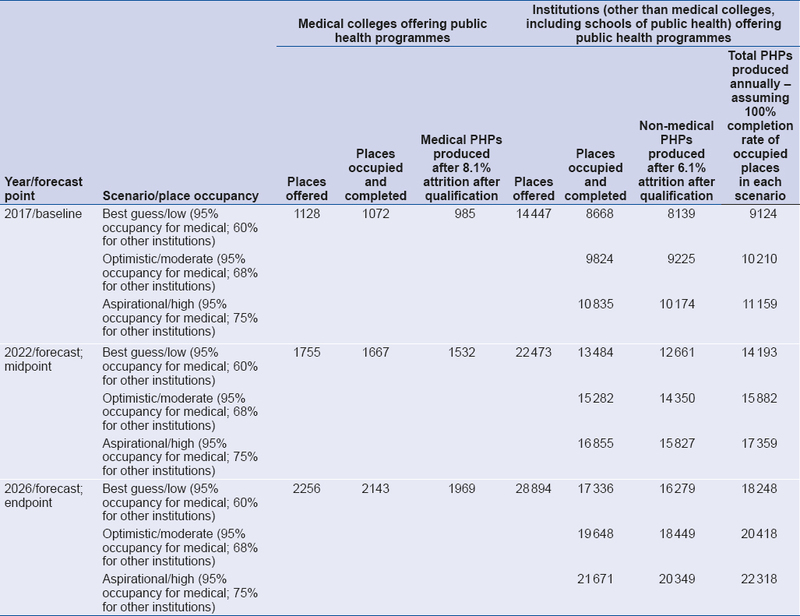 A place occupancy of 95% was assumed for these public health programmes for medical doctors. There are no formal data on this level of occupancy, but the anecdotal value of 95% has been used in other workforce estimates, and so is used here for consistency. It was also assumed that the 95% occupancy would be constant for the forecast time period. An annual attrition rate of 8.1% for medically qualified PHPs was applied. This was based on (i) the annual death rate of 3.1% population in the age group 15–59 years, as per the 2010 census; and (ii) an estimated annual migration of doctors from India of 5%. Other reasons for attrition, such as change of profession and retirement, were not included. The number of MPH places available in 2010 doubled from approximately 573 (23 institutions) to 1190 (44 institutions) in 2016–2017. Since, in the same time period, two out of 46 institutes offering the MPH closed down, it was assumed that expansion in the number of places would continue because of the “pull” factors related to recent government health reforms, but at a lower rate. A doubling of the number of places for non-medical institutions during 2017–2026 was therefore assumed. A low place occupancy of 60% of available places. This is the “best guess” scenario most likely to happen without any intervention. It was used because previous work showed that , in the 2016–2017 academic year, 1190 places were being offered on MPH programmes but only 704 students were enrolled; i.e. a place occupancy of 59%. A moderate seat occupancy of 68% of available seats. This is the “optimistic” scenario that it was estimated could happen, with feasible policy and administrative interventions. A high seat occupancy of 75%. This is the “aspirational” scenario that was estimated to be unlikely to happen without significant advocacy and appropriate intervention. An annual attrition rate of 6.1% for non-medically qualified PHPs was applied. As for medical professionals, this was based on the annual death rate of 3.1% population in the age group 15–59 years, as per the 2017 census. It was assumed that annual migration would be lower than that of medical professionals and an estimate of 3% was used. Other reasons for attrition, such as change of profession and retirement, were not included. 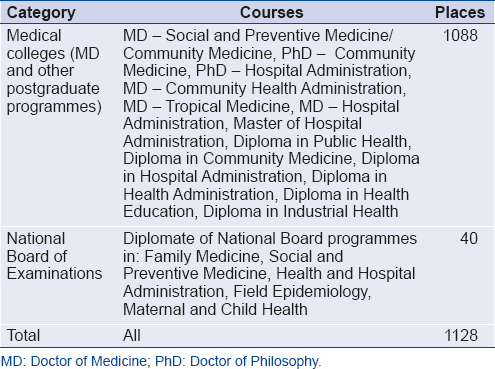 Medical programmes. The courses identified as contributing to medical PHPs were in two categories: via medical colleges (Doctor of Medicine [MD] and other postgraduate programmes) and via the NBE. For 2017, it was estimated that 1128 of these medical public health training places were offered (see [Table 1]). Non-medical programmes. 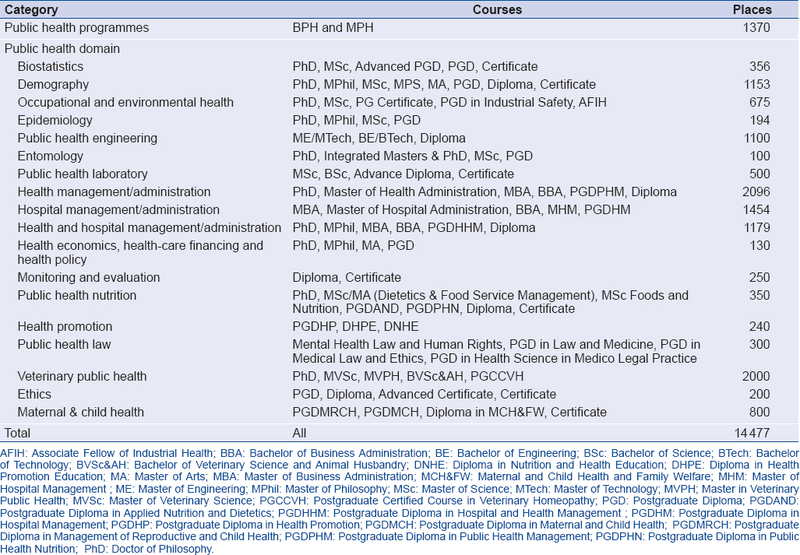 The courses identified as contributing to non-medical PHPs were via public health programmes – Bachelor of Public Health (BPH) and MPH – and via public health domains. The results are provided in [Table 2]. For 2017, it was estimated that 14 477 of these non-medical public health training places were offered. Based on the assumptions made on projected growth in the number of places and the three place-occupancy scenarios for non-medical PHPs, the estimated supply of PHPs produced annually for the years 2017, 2022 and 2026 is shown in [Table 3]. First, the normative need for PHPs in 2017 was calculated using the service–target approach for PHPs in the areas of practice, research and education for 15 public health domains. Standards were created and assumptions made by interacting with public health experts and by review of the literature. 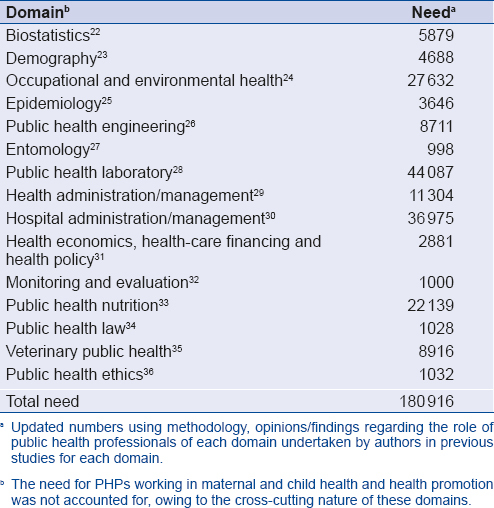 The need for PHPs working in maternal and child health and health promotion was not included, owing to the cross-cutting nature of these domains. The methodology for estimating the normative need in 2017 for each domain depended on the extent and nature of work done to date on workforce needs in that domain. The detailed description of these estimates will be published elsewhere and is available from the corresponding author on request. In brief, where previous work directly estimated the service–target need in that domain, the methodology was repeated and updated to provide an estimate for 2017. For some domains, however, the only previous research available was on training provision and landscaping the main employment roles in that domain. In these instances, the data on training were used to estimate the teaching faculty portion for each domain, based on the faculty:student ratios stipulated by the University Grants Commission. The non-teaching component for each of these domains was calculated based on the main employment roles available. For illustration, for biostatistics the normative need was calculated from the following estimates: 474 (faculty for each of the 474 medical colleges’ departments of preventive and social medicine/community medicine, as per Medical Council of India recommendations) + 4 (faculty for doctoral programmes) + 92 (faculty for masters’ programmes) + 229 (for health management, hospital administration, public health programmes) + 1000 (professionals for national research and training institutes) + 1500 (for academic/research organizations) + 1000 (in corporate sector) + 500 (in international organizations) + 1080 (in pharmaceutical companies/contract research organizations). This gave a total estimated need for 5879 PHPs in the biostatistics domain in 2017. The estimated normative need in each of the 15 domains in shown in [Table 4]. Second, in addition to the estimates described above, the additional need deriving from the strategy outlined in the National Health Policy 2017, which explicitly proposes creation of a public health management cadre in all states, was also estimated. Third, the estimated number of the 2017 PHP workforce was used to calculate the number of PHPs per 100 000 population, based on the World Bank population estimates and projections for 2017–2026. This is a simple, standard measure of health workforce coverage. [Table 4] shows the estimated normative need for each of the 15 domains studied, giving a total of 180 916 PHPs for the baseline year of 2017. For forecasting, the need:population ratio was assumed to be constant and applied to the World Bank population projections to estimate the service–target need for the years 2018 to 2026 (see [Table 5]). For the additional need to fulfil the strategy of developing a public health management cadre outlined in the National Health Policy 2017, the recommended number of posts required was applied, based on previous work; this was 9 at each state/union territory level, 14 at each district level, and 4 at each block level. This gave a need of 33 236 additional public health management posts by 2026 (i.e. 9 × 36 states/union territories + 14 × 640 districts + 4 × 5988 blocks; see [Table 5]). With respect to roll-out of this public health management cadre, it was assumed that one third of the states/union territories will implement the cadre by 2020, another one third by 2023 and all by 2026 (see [Table 5]). Data on the prevalence of occupational vacancies in the health-care system in India overall are scarce. For example, government statistics for 2008, based on vacancies in sanctioned posts, showed 18% of primary health centres were without a doctor, about 38% were without a laboratory technician and 16% were without a pharmacist. For PHPs, it was assumed that the number of vacant posts would be lower, at 15%, because their role is largely non-clinical, and that elements relevant to attrition of clinical staff, such as fear of occupational infection, are less likely to apply. Thus, for the estimated 180 916 posts in 2017, it was estimated that 153 779 (i.e. 85%) were occupied. Therefore the number of PHPs per 100 000 population based on the 2017 World Bank estimate for the population of India (i.e. 1 339 180 000) is 11. The number of PHPs currently in the workforce was assumed to be 85% of the estimated need for PHPs for the baseline year 2017. For subsequent years, the net number of PHPs in the health workforce was estimated as the sum of the number of PHPs in the health workforce and PHPs produced annually, minus the number of PHPs exiting the workforce (medical PHPs exiting at 8.1% – through death [3.1%] and migration [5%]; non-medical PHPs exiting at 6.1% – through death [3.1%] and migration [3%]). It was assumed that the current composition of the PHP workforce, based on National Sample Survey Office (NSSO) estimates, would remain constant at 20% medical and 80% non-medical PHPs. In the “moderate place occupancy (95% medical and 68% non-medical PHPs) – optimistic scenario” – in the year 2017 there was an gap of almost 27 000 PHPs; however, if PHPs are produced annually at a similar rate of 11 PHPs per 100 000 population and additionally if the public health cadre is instituted – assuming that one third of the states will implement the public health cadre by 2020, another one third by 2023 and all states by 2026 – then in the year 2026 this gap will have gone up to more than 32 000 PHPs (see [Figure 1]). The 2017 population of India was 1.33 billion and the normative need was estimated to be 180 916 PHPs (see [Table 5]). It was assumed that, of these 180 916 positions for PHPs in India, around 85% of positions are currently occupied; hence, the number of PHPs in the health workforce is 153 779. Additionally, as per the moderate scenario, 10 210 PHPs are produced (see [Table 3]). As per NSSO estimates, 20% of India’s health workforce has a medical background/are physicians., Thus, if the medical PHPs are exiting the workforce at 8.1% and non-medical PHPs are exiting at 6.1%, 9996 PHPs are exiting the workforce that year. Thus, the net number of PHPs in the health workforce (HWF) for 2017 is estimated as: net PHPs in HWF = number of PHPs in HWF + PHPs supplied – PHPs exiting HWF (moderate place occupancy), i.e. 153 779 + 10 210 – 9996 = 153 993. The additional need for PHPs for this year (net number of PHPs deducted from the total need, i.e. 180 916 – 153 993) is therefore 26 923 PHPs. Since the public health cadre has not yet been initiated, its need has not been accounted for until the year 2020. For 2018, with a population of 1.35 billion and total need of 182 925 (see [Table 5]), the number of PHPs in the health workforce was assumed to be the net number in the previous year, i.e. 153 993. As per the moderate scenario, 11 344 PHPs are produced. At an 8.1% exit rate of medical PHPs and 6.1% exit rate of non-medical PHPs, 10 010 PHPs leave the workforce. Thus, the net number of PHPs in the health workforce is estimated as: net PHPs in HWF = number of PHPs in HWF + PHPs supplied – PHPs exiting HWF (moderate place occupancy); i.e. 153 993 + 11 344 – 10 010 = 155 327. Thus, if this net number of PHPs is deducted from the total need (i.e. 182 925 – 155 327), then there is an additional need for 27 598 PHPs. Again, the need for the public health cadre has not been accounted for until the year 2020. Similarly, in the best guess scenario, i.e. with low non-medical place occupancy of 60% for the year 2017, there is a gap of around 28 000 PHPs; this increases to 45 000 PHPs by the year 2026. By contrast, in the aspirational scenario, i.e. with a high place occupancy of 75% for non-medical places, the baseline gap for 2017 of almost 26 000 PHPs reduces to around 21 000 PHPs in the year 2026. [Figure 1] illustrates the three scenarios. For a lower-middle-income country like India, with a huge population base but without a public health council, standardized definition of PHPs, or valid and reliable estimates, estimating and bringing together information regarding the supply and need aspects of PHPs was a substantial challenge. The aim was not to provide granular, detailed forecasts but rather an overarching view of possible directions of change to inform policy-making. Since so many aspects of public health education and work in India are unknown, a series of assumptions was necessary, as was curtailment of the number of influencing factors considered. For example, reasons for workforce attrition, such as change of profession or retirement, were not included; no attempt was made to adjust for the different lengths of courses considered; the possibility of individuals working in more than one discipline was not counted; and any change in the technology (increasing efficiency) of current public health services was not considered for the projections. Notably, the need for PHPs working in maternal and child health and health promotion was not accounted for, owing to the cross-cutting nature of these domains; as important areas, this omission means the gaps are much wider than indicated. Another limitation during the study was the lack of clarity regarding educational programmes to be included/excluded from this work while estimating the supply of PHPs in the absence of a public health council or body; there is a need for specifying the names and details of professionals (their educational qualifications) to be included or excluded in the broader definition of PHPs for India. Also, the numbers obtained for service statistics do not distinguish between roles in the public and private sectors. It may be possible to include these, and other refinements and updated and more informed assumptions, in future analyses that build on this work and will become particularly important when forecasting at the state or lower local levels. For supply estimation, a mathematical simulation of workforce supply projections in academic programmes being offered various public health domains was a suitable methodology. For need estimation, adopting the traditional service–target approach was important to capture the critical information in various specialist domains nationwide. Additionally, considering the uncertainty of the future, it was essential to provide estimates for possible future scenarios. It was estimated that the number of PHPs in India in 2017 was 11 per 100 000 population, substantially below the Association of Schools of Public Health recommendation of 220 PHPs per 100 000 population. The forecast from this study is based on an assumption that the number of both medical and non-medical public health course places will double between 2017 and 2026. Thus, to meet the existing and forecast shortage of PHPs in the health workforce, increasing the number of places from both medical colleges and institutions offering public health programmes (including schools of public health) will be necessary. If, for subsequent years, it is assumed that, instead of 100% growth in the supply of places for PHPs, growth is only 50%, then in the optimistic scenario of moderate non-medical place occupancy of 68%, the gap of 27 000 PHPs for 2017 will increase up to 54 000 PHPs by 2026. 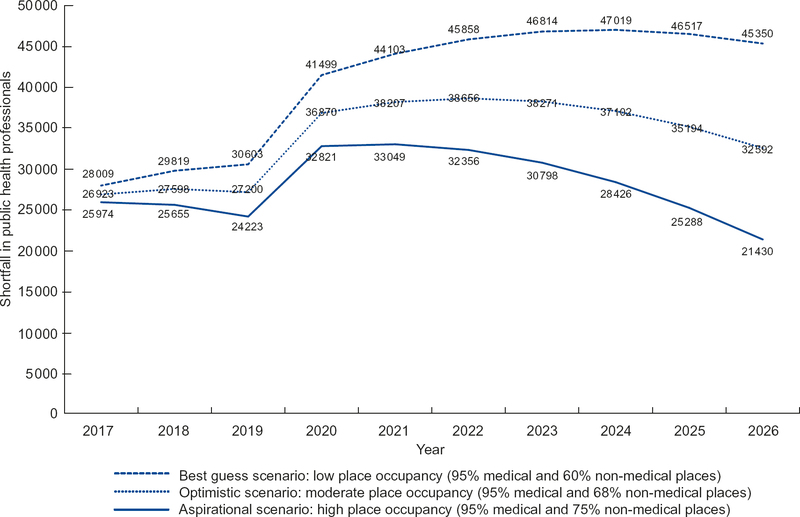 If growth in the supply of places is only 50%, similarly, in the best guess scenario with a low non-medical place occupancy of 60%, the gap of 28 000 PHPs in 2017 will increase to 64 000 PHPs and in the aspirational scenario with high place occupancy of 75%, the gap of 26 000 PHPs in 2017 will increase to 45 000 PHPs in the year 2026. Increasing capacity alone, however, will not be sufficient. Public health programmes are already undersubscribed and students are not currently trained according to an explicitly stated, standardized competency framework that is tailored to the Indian context. Policy-makers will have to examine issues surrounding low uptake of existing places, and review the current framework regulating education of PHPs, in order to adequately respond to future PHP requirement. Increased clarity on the role of public health graduates in India’s public health infrastructure would help institutions to adjust their programmes and ensure graduates are equipped with the required skill sets. The Government of India has recently undertaken efforts towards designing a model for a MPH qualification. Tackling these issues will be essential, since 90% of the public health graduates who will work in public health across the country will come from a non-medical background. The need for a public health cadre has been recognized for many years. In 2005, the National Commission on Macroeconomics and Health identified that failure to develop a public health cadre and widen the eligibility criteria to include clinicians, without making public health training a mandatory requirement for working in posts that need public health skills, had adversely affected the implementation of public health programmes. As stated by Datta in 2009, the demand for public health education depends on the career options available for PHPs with medical and non-medical backgrounds, in a balanced way in the central, state, district and local government health organizations and in academic and research institutions. Currently, public health graduates in India are employed in the public, private and nongovernmental sectors, in teaching, research and implementation roles. However, there are no well-defined career pathways, which is a significant barrier for MPH graduates who wish to work in the public sector. Thus, to generate demand for the public health programmes and increase their place occupancy, there is a need to create more job opportunities for PHPs with a non-medical background, to encourage the workforce serving the Indian public health system. Revamped designations and clarity of roles must be worked out for appropriate job responsibilities. If no intervention to influence the supply side is undertaken, then the probability is that market forces might lead to mushrooming of public health institutions in an unregulated manner, to cater for the demand for PHPs in the country. Formal recognition of the need to remedy this situation came in the National Health Policy 2017 and 2018 NITI Aayog report, Strategy for New India@75. With respect to a defined career structure, there is also a need to revise the salary brackets of PHPs in India. PHPs are expected to work in tough terrains on poor pay packages by most of the organizations working in the field of public health. Adequate remuneration is essential to ensuring higher place occupancy for training in public health. The government needs to ensure a good quality of life for PHPs entering the public system if the projected shortfalls are to be averted. The projections for the aspirational scenario are only likely to be realized through concerted advocacy and action in several areas by policy-makers and by the Government of India. Authorship: All authors were involved in the overall study design. RT conducted the literature review and collected the data. HN and RT analysed the data. RT wrote the first draft of the manuscript, which was reviewed and commented upon by HN and SZ, who reviewed it critically for important intellectual content. Global indicator framework for the Sustainable Development Goals and targets of the 2030 Agenda for Sustainable Development. New York: United Nations; 2018 (A/RES/71/313; E/CN.3/2018/2; https://unstats.un.org/sdgs/indicators/Global%20Indicator%20Framework%20after%20refinement_Eng.pdf, accessed 4 March 2019). Hazarika I. Health workforce in India: assessment of availability, production and distribution. WHO South-East Asia J Public Health. 2013;2(2):106–12. doi:10.4103/2224-3151.122944.3. Hernandez LM, Rosenstock L, Gebbie K. Who will keep the public healthy? Educating public health professionals for the 21st century. Institute of Medicine. Washington (DC): National Academies Press; 2003. Working together for health: the world health report 2006. Geneva: World Health Organization; 2006 (https://www.who.int/whr/2006/whr06_en.pdf?ua=1, accessed 4 March 2019). Liu JX, Goryakin Y, Maeda A, Bruckner T, Scheffler R. Global health workforce labor market projections for 2030. Hum Resour Health. 2017;15(1):11. doi:10.1186/s12960-017-0187-26. Ved RR. India’s health and wellness centres: realizing universal health coverage through comprehensive primary health care. WHO South-East Asia J Public Health. 2019;8(1):18–20. doi:10.4103/2224-3151.xxxxxx. National Health Policy 2017. New Delhi: Ministry of Health and Family Welfare, Government of India; 2017 (http://164.100.158.44/showfile.php?lid=4275, accessed 4 March 2019). Strategy for New India@75. New Delhi: NITI Aayog; 2018 (http://niti.gov.in/writereaddata/files/Strategy_for_New_India.pdf, accessed 4 March 2019). Negandhi H, Sharma K, Zodpey SP. History and evolution of public health education in India. Indian J Public Health. 2012;56(1):12–16. doi:10.4103/0019-557X.96950. Tiwari R, Negandhi H, Zodpey S. Current status of Master of Public Health programmes in India: a scoping review. WHO South-East Asia J Public Health. 2018;7(1):29–35. doi:10.4103/2224-3151.228425. Ono T, Lafortune G, Schoenstein M. Health workforce planning in OECD countries. A review of 26 projection models from 18 countries. OECD Health Working Papers 62. Paris: OECD Publishing; 2013 (https://www.oecd-ilibrary.org/docserver/5k44t787zcwb-en.pdf?expires=1551718011&id=id&accname=guest&checksum= 620FF04E14C96933777B479EBD9D1138, accessed 4 March 2019). Approach paper on public health cadre. New Delhi: Task Force on Public Health Cadre; 2012. Ridoutt L Cowles C, Madden L, Stewart G. Planned and unplanned futures for the public health physician workforce in Australia. Sydney: Australasian Faculty of Public Health Medicine; 2017 (https://www.racp.edu.au/docs/default-source/default-document-library/AFPHM-public-health-physician-workforce-futures-report.pdf, accessed 4 March 2019). National Board of Examinations. About us (https://natboard.edu.in/aboutus.php, accessed 4 March 2019). shiksha. Empowering millions of students in making the right career and college decision (https://www.shiksha.com/, accessed 4 March 2019). TARGETSTUDY. Education. Knowledge. Career (https://targetstudy.com/, accessed 4 March 2019). GETMYUNI (https://www.getmyuni.com/, accessed 4 March 2019). webindia123. Education & career (https://career.webindia123.com/, accessed 4 March 2019). Estimates of mortality indicators. In: SRS statistical report 2016. New Delhi: Office of the Registrar General & Census Commissioner, India; 2016: 121–83 (http://www.censusindia.gov.in/vital_statistics/SRS_Report_2015/8.Chap%204-Mortality%20Indicators-2015.pdf, accessed 4 March 2019). Sinha K. 1,333 doctors migrated abroad last year. The Times of India. 14 May 2012 (https://timesofindia.indiatimes.com/india/1333-doctors-migrated-abroad-last-year/articleshow/13128728.cms, accessed 4 March 2019). The World Bank. Population estimates and projections (https://data.worldbank.org/data-catalog/population-projection-tables, accessed 4 March 2019). Singh R, Zodpey SP, Sharma K, Bangdiwala SI, Ughade S. Landscaping biostatistics education in India. Indian J Public Health. 2012;56(4):273–80. doi:10.4103/0019-557X.106414. Tiwari R, Singh R, Zodpey S. Landscaping academic programs offered in demography and population studies in India. Indian J Public Health. 2015;59(3):178–88. doi:10.4103/0019-557X.164655. Sharma K, Zodpey SP, Tiwari RR. Need and supply gap in occupational health manpower in India. Toxicol Ind Health. 2013;29(6):483–9. doi:10.1177/0748233711430981. Zodpey S, Pandey A, Murhekar M, Sharma A. Landscaping capacity-building initiatives in epidemiology in India: bridging the demand–supply gap. WHO South-East Asia J Public Health. 2015;4(2):204–12. doi:10.4103/2224-3151.206691. Hussain MA, Sharma K, Zodpey S. Public health engineering education in India: Current scenario, opportunities and challenges. Indian J Public Health. 2011;55(2):100–106. doi:10.4103/0019-557X.85240. Pandey A, Zodpey S, Kumar R. Demand–supply gaps in human resources to combat vector-borne disease in India: capacity-building measures in medical entomology. WHO South-East Asia J Public Health. 2015;4(1):92–7. doi:10.4103/2224-3151.206627. Pandey A, Zodpey S, Shrikhande S, Sharma A. Human resource capacity building initiatives for public health laboratories in India. Indian J Public Health. 2014;58(4):224–9. doi:10.4103/0019-557X.146275. Sharma K, Zodpey S. Need and opportunities for health management education in India. Indian J Public Health. 2010;54(2):84–91. doi:10.4103/0019-557X.73276. Sharma K, Zodpey S. Demand and supply analysis of human resource capacity for hospital management in India. J Health Manag. 2011;13(2):155–76. doi:10.1177/097206341101300203. Hasan H, Pandey A, Sharma K, Zodpey S. Changing landscape of health care in India: need for capacity building in health economics and financing. J Health Manag. 2013;15(4):501–7. doi:10.1177/0972063413516220. Negandhi H, Negandhi P, Tiwari R, Sharma A, Zodpey S, Kulatilaka H et al. Developing core competencies for monitoring and evaluation tracks in South Asian MPH programs. BMC Med Educ. 2015;15(1):126. doi:10.1186/s12909-015-0403-5. Khandelwal S, Dayal R, Jha M, Zodpey S, Reddy KS. Mapping of nutrition teaching and training initiatives in India: the need for public health nutrition. Public Health Nutr. 2012;15(11):2020–5. doi: 10.1017/S1368980011003016. Hazarika S, Yadav A, Reddy K, Prabhakaran D, Jafar T, Narayan K. Public health law in India: a framework for its application as a tool for social change. Natl Med J India. 2009;22(4):199–203. Kakkar M, Abbas SS, Kumar A, Hussain MA, Sharma K, Bhatt PM et al. Veterinary public health capacity-building in India: a grim reflection of the developing world’s underpreparedness to address zoonotic risks. WHO South-East Asia J Public Health. 2013;2(3):187–91. doi:10.4103/2224-3151.206767. Pati S, Sharma A, Zodpey S. Teaching of public health ethics in India: a mapping exercise. Indian J Med Ethics. 2014;11(3):185–90. doi:10.20529/IJME.2014.048. Government of India. Rural health statistics in India – 2008 (https://data.gov.in/catalog/rural-health-statistics-india-2008, accessed 4 March 2019). Government of India. Ministry of Statistics and Programme Implementation. National Sample Survey Office (NSSO) (http://www.mospi.gov.in/national-sample-survey-office-nsso, accessed 4 March 2019). Strategic Framework on Human Resources for Health (HRH) in India. New Delhi: Public Health Foundation of India; 2016. ASPH policy brief – confronting the public health workforce crisis. Washington (DC): Association of Schools of Public Health; 2008 (http://www.healthpolicyfellows.org/pdfs/ConfrontingthePublicHealthWorkforceCrisisbyASPH.pdf, accessed 4 March 2019). Model curriculum handbook. Masters in Public Health (MPH). New Delhi: Ministry of Health & Family Welfare, Government of India; 2018 (https://tinyurl.com/y74ybfot, accessed 4 March 2019). Report of the National Commission on Macroeconomics and Health. New Delhi: Ministry of Health & Family Welfare, Government of India; 2005 (http://www.who.int/macrohealth/action/Report%20of%20the%20National%20Commission.pdf, accessed 4 March 2019). Datta K. Public health workforce in India: career pathways for public health personnel. New Delhi: World Health Organization and Ministry of Health & Family Welfare, Government of India; 2009 (http://cccindia.org.in/Public_Health_CH.pdf, accessed 4 March 2019). Sharma K, Zodpey S, Syed Z, Gaidhane A. Career opportunities for master of public health graduates in India. Asia Pacific Journal of Health Management. 2013;8(1):45–50. Dahal S, Sharma A, Zodpey S. Mapping of public health jobs in India – where can the public health graduates be employed? J Health Manag. 2018:20(1):73–83. doi:10.1177/0972063417747725. Fernandes E. Why India needs a Ministry of Public Health. The Times of India. 1 July 2016 (https://blogs.timesofindia.indiatimes.com/global-health-focus/why-india-needs-a-ministry-of-public-health/, accessed 4 March 2019).